Page Parkes Model + Talent: New Houston Workshop For Serious Actors!! 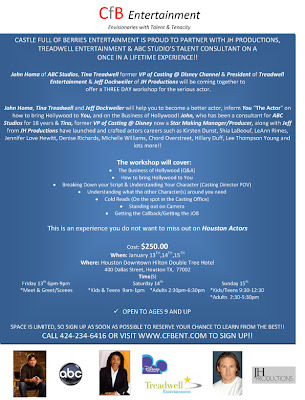 New Houston Workshop For Serious Actors!! Do you want to learn more about the Hollywood business, how to stand out on camera and how to land the job? Then this workshop is for you!! John Homa of ABC Studios, Tina Treadwell former VIP of Casting at Disney Channel & President of Treadwell Entertainment & Jeff Dockweiler of JH Productions will be coming together to offer a THREE DAY workshop for the serious actor. Call 424-234-6416 or visit www.cfbent.com to sign up!